Hangover headache occurs after excessive consumption of alcohol. Headache is one of the symptoms of hangover and it might be associated with other symptoms like nausea, vomiting, diarrhea, excessive thirst, depressed mood, anxiety, irritability, fatigue, weakness, photophobia, etc. The headache is usually described as throbbing headache occurring in the frontal and/or occipital (posterior) region of the head. Usually hangover is experienced in the morning following a night of heavy drinking. However, it can occur anytime after the intoxicating effects of alcohol have subsided. The mechanism of hangover has not been known, but possible causes like dehydration, congeners, or the ethanol metabolite acetaldehyde are supposed in many theories behind it. Innumerable methods have been suggested as a remedy for hangover, but only few have proven effectiveness. Even those with proven efficacy may not be effective in all the people. Drinking Lots of Fluids: Water, fruit juices, energy drinks, soups, etc. help in rehydrating the body and provide some relief from the headache. Fruit juices and soups are better options in comparison to plain water because they also provide necessary electrolytes. Moreover, taking adequate amounts of fluids before going to bed is effective in reducing the severity of headaches or even preventing it. Painkillers: NSAIDs like aspirin and ibuprofen can provide relief for your head pain. However, because of their propensity to cause irritation of gastrointestinal tract, they are best avoided if one is experiencing gastrointestinal symptoms like nausea, vomiting, diarrhea, abdominal pain, etc. Pass the Time: Hangover slowly resolves after some time. Usually it resolves in few hours but may last up to 1-3 days. Excessive alcohol should be avoided in the future to prevent the recurrence of headache. The following popular methods of "treating" hangover have no effect in treating or preventing hangover headaches. Moreover, many of these may even worsen the condition. So when you heard about these, just ignore them. Drinking Alcohol in the Morning: This is not a good method to fight headache pain after drinking alcohol. Although drinking alcohol in the morning may provide some temporary relief from the symptoms, this only delays the hangover. Hangover symptoms will again return once the blood alcohol levels falls again. 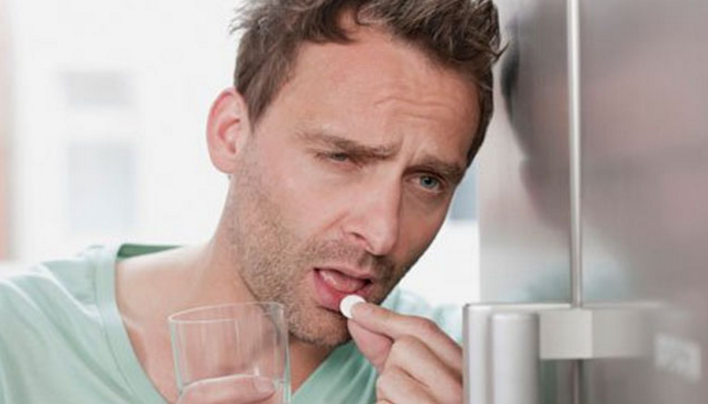 Taking Acetaminophen Before Going to Bed: Acetaminophen (Tylenol) should never be taken after drinking heavily. Acetaminophen has potential to cause liver toxicity and this effect is potentiated in presence of alcohol. Moreover, the headache relieving effects of acetaminophen won't last till morning. Coffee: Preferably this should be avoided. Coffee only provides temporary relief. Moreover, it can worsen dehydration by causing increased urine formation. This would result in increase in severity and duration of hangover. Eating Fried and Greasy Foods or Burnt Toast. Only definitive preventive measure is not drinking alcohol (or drinking very little alcohol). However, complete abstinence from the alcohol may not be possible. Therefore, the ideal step is to drink only moderate amount of alcohol that won't cause hangover. The hangover symptoms and the severity increases with the increased amount of alcohol intake. However, there is no clear cut limit for the amount of alcohol that will prevent hangover in all people. The amount of alcohol that can be tolerated varies from person to person. Ideally, the currently recommended maximum amount of alcohol is one drink daily for women and two drinks daily for men (one drink having approximately 14g of ethanol). As already mentioned above, drinking lots of fluids before going to bed also helps in preventing or at least reducing the severity of headaches next morning.